BRAF, KRAS and PIK3CA mutations are frequently found in sporadic colorectal cancer (CRC). In contrast to KRAS and PIK3CA mutations, BRAF mutations are associated with tumours harbouring CpG Island methylation phenotype (CIMP), MLH1 methylation and microsatellite instability (MSI). We aimed at determine the frequency of KRAS, BRAF and PIK3CA mutations in the process of colorectal tumourigenesis using a series of colorectal polyps and carcinomas. In the series of polyps CIMP, MLH1 methylation and MSI were also studied. Mutation analyses were performed by PCR/sequencing. Bisulfite treated DNA was used to study CIMP and MLH1 methylation. MSI was detected by pentaplex PCR and Genescan analysis of quasimonomorphic mononucleotide repeats. Chi Square test and Fisher's Exact test were used to perform association studies. KRAS, PIK3CA or BRAF occur in 71% of polyps and were mutually exclusive. KRAS mutations occur in 35% of polyps. PIK3CA was found in one of the polyps. V600E BRAF mutations occur in 29% of cases, all of them classified as serrated adenoma. CIMP phenotype occurred in 25% of the polyps and all were mutated for BRAF. MLH1 methylation was not detected and all the polyps were microsatellite stable. The comparison between the frequency of oncogenic mutations in polyps and CRC (MSI and MSS) lead us to demonstrate that KRAS and PIK3CA are likely to precede both types of CRC. BRAF mutations are likely to precede MSI carcinomas since the frequency found in serrated polyps is similar to what is found in MSI CRC (P = 0.9112), but statistically different from what is found in microsatellite stable (MSS) tumours (P = 0.0191). Our results show that BRAF, KRAS and PIK3CA mutations occur prior to malignant transformation demonstrating that these oncogenic alterations are primary genetic events in colorectal carcinogenesis. Further, we show that BRAF mutations occur in association with CIMP phenotype in colorectal serrated polyps and verified that colorectal serrated polyps and MSI CRC show a similar frequency of BRAF mutations. These results support that BRAF mutations harbour a mild oncogenic effect in comparison to KRAS and suggest that BRAF mutant colorectal cells need to accumulate extra epigenetic alterations in order to acquire full transformation and evolve to MSI CRC. In microsatellite unstable (MSI) colorectal tumours, both sporadic and inherited forms, hundreds of thousands of mutations accumulate within repetitive sequences throughout the genome . Although genes with repetitive sequences are clear targets in tumours with a defective mismatch repair system, mutations in non-repetitive sequences are also found in MSI tumours. An example of this is the occurrence of activating mutations of KRAS, PIK3CA and BRAF genes. Activating mutations of BRAF and KRAS are frequently found in sporadic colorectal (CRC) cancer. BRAF mutations occur in about 10 to 18% of CRC overall and in 30 to 45% of MSI CRC [2, 3], more frequently in tumours harbouring MLH1 promoter hypermethylation  and with a CpG island methylation phenotype (CIMP) . In microsatellite stable (MSS) CRC BRAF mutations are rare and whenever present are associated with advanced carcinomas . KRAS mutations occur in both MSI (in about 20%) [3, 6, 7] and MSS (in about 35%) subsets of sporadic CRC [5, 6]. Within the MSI subset of CRC KRAS mutations do not associate with the presence of MLH1 promoter hypermethylation  or with the presence of CIMP . PIK3CA mutations were identified in various tumour models . In colorectal tumours, PIK3CA mutations are present in 14% to 25% of the cases [9, 10] and no differences in frequency and type of PIK3CA mutations were found between MSI and MSS subsets . Further, whenever PIK3CA mutations occur in CRC they can occur in concomitance with activating KRAS-BRAF mutations, both in MSI and MSS tumours . Nothing is known on the relationship between PIK3CA mutations and CIMP or MLH1 methylation in colorectal carcinomas. The aim of the present study was to determine the timing of occurrence of KRAS, BRAF and PIK3CA mutations in the process of colorectal tumourigenesis and study the association of these mutational oncogenic events with CIMP, MLH1 methylation and MSI phenotype. In order to achieve our goal we evaluated the frequency and type of these epi/genetic events in a series of 17 colorectal polyps. Furthermore, we compared the frequency of KRAS, BRAF and PIK3CA mutations found in polyps with the frequency found in a series of 103 sporadic colorectal tumours, 50 MSI CRC and 53 MSS CRC, in order to understand the importance of these oncogenic events for the progression of the various types of colorectal cancer. In conclusion, our results show that mutations of BRAF, KRAS and PIK3CA occur in non-malignant lesions of colorectum demonstrating that these oncogenic alterations are primary genetic events in colorectal carcinogenesis. Further, we show that BRAF mutations occur in association with CIMP phenotype in colorectal serrated polyps while KRAS mutations are found alone. These results support that BRAF mutations harbour a mild oncogenic effect in comparison to KRAS and suggest that BRAF mutant colorectal cells need to accumulate extra epigenetic alterations in order to acquire full transformation. Representative blocks of 17 colorectal polyps and 103 colorectal carcinomas formalin-fixed, paraffin embedded were retrieved from the Department of Pathology of the Hospital S. João. This study was a retrospective analysis and is in compliance with Helsinki declaration http://www.wma.net/e/policy/b3.htm. The 103 sporadic CRC were previously classified for microsatellite status, 53 were MSS and 50 were MSI colorectal carcinomas . The histological classification of the seventeen paraffin embedded colorectal polyps is listed in table 1. None of the patients included in this study had a positive family history. DNA from these 17 polyps was extracted using the Invisorb Spin Tissue Mini Kit (Invitek). BRAF (exon 15) and KRAS (exon 1) were amplified by PCR and the presence of mutations was detected by direct sequencing. To perform methylation studies, DNA extracted from paraffin embedded lesions was submitted to bisulfite treatment. CIMP was determined in 12 cases by methylation specific PCR (MSP) using the new panel of five markers described by Weisenberger . The polyps were classified as CIMP (≥ 3 methylated markers), and CIMP-negative (≤ 2 methylated markers). We were able to analyze MLH1 methylation in 7 samples. For that the promoter region of the gene was amplified using a set of CpG island flanking primers (sense 5'ttttgtttttattggttggatattt, antisense 5'ccttcaaccaatcacctcaatacct) followed by direct sequencing. Microsatellite instability studies were performed by genescan analyses of a PCR amplified panel of five mononucleotide markers (NR27, NR24, NR21, Bat25 and Bat26) using the Multiplex PCR Kit (Qiagen). MSI was considered when two or more microsatellite markers were altered. Association studies between the frequency of KRAS, PIK3CA and BRAF in colorectal polyps and MSI and MSS CRC were performed using the Chi Square test and Fisher's Exact test. A P-value ≤ 0.05 was considered to be statistically significant. In our series of colorectal polyps, we found that mutations in KRAS, PIK3CA or BRAF are mutually exclusive and occur in the majority of these pre-malignant colorectal lesions. Mutations in KRAS, PIK3CA or BRAF occur in 12 (70.6%) of the 17 colorectal polyps (Table 1). KRAS mutations were found in 35.3% (6/17) of polyps. KRAS mutant polyps showed three different types of mutations with the same frequency within the two most common hotspot codons (12 and 13): G12D (33.3% – 2/6), G12V (33.3% – 2/6) and G13D (33.3% – 2/6). KRAS mutations were only found in polyps with some areas with dysplasia. In contrast with the high frequency of KRAS mutations found in our series, PIK3CA mutations were observed in only one of the polyps analyzed (5.9%) (Table 1). The PIK3CA mutation found was localized to exon 20 and affects amino acid 1023 leading to an arginine-glutamine substitution (R1023Q). This PIK3CA mutation resides in a hotspot exon for mutations that has been previously reported in a MSI colorectal tumour . BRAF mutations were found in 29.4% (5/17) of the cases (Table 1). All BRAF mutations found in our series of polyps corresponded to the hotspot BRAF V600E and all polyps with BRAF mutations exhibited the serrated architecture. We studied the presence of CIMP phenotype, MLH1 promoter methylation and MSI phenotype and their association with the presence of KRAS, BRAF and PIK3CA mutations in the series of polyps. Using the Weisenberger  panel of CIMP markers three of 12 polyps analyzed (25%) were classified as CIMP (≥ 3 methylated markers). All of the CIMP polyps were mutated for BRAF (Table 1). None of the CIMP polyps harbour KRAS mutations. The methylation analysis of MLH1 was possible in 7 of the 17 polyps. Two of these 7 polyps were mutated for KRAS, 2 harboured BRAF mutations and 3 were wild-type for both genes. None of the 7 polyps studied harboured methylation in the promoter region of MLH1 (Table 1). Furthermore, we determined the MSI status of all polyps using the pentaplex set of microsatellite markers . None of them were MSI. 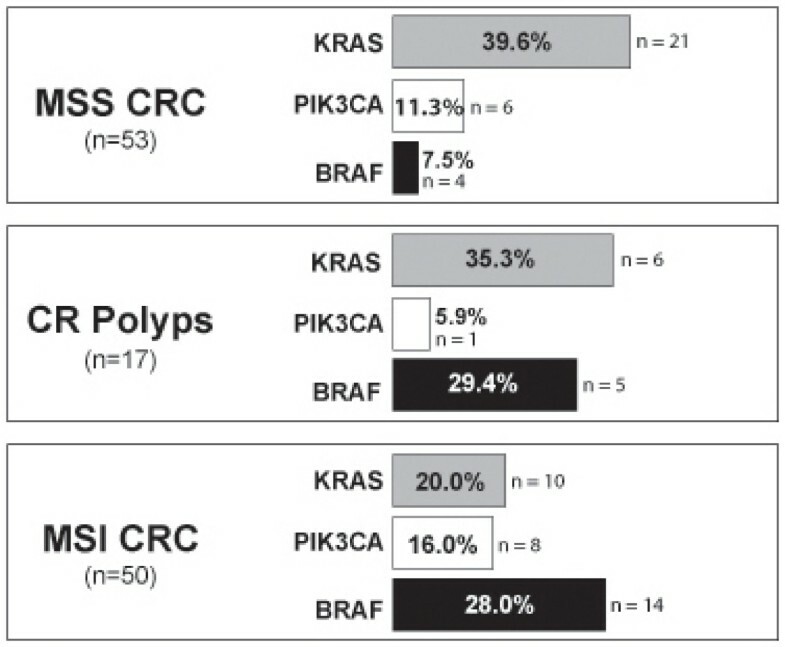 In order to understand the importance of KRAS, PIK3CA and BRAF mutations for the progression of the various types of colorectal cancer, we compared the frequency of these oncogenic events in the series of polyps and in 50 MSI and 53 MSS CRC (Figure 1). KRAS , PIK3CA and BRAF mutation frequencies between MSI/MSS CRC and CR polyps. The frequency of KRAS, PIK3CA and BRAF mutations in MSI and MSS CRC was based on previous results of our group in Velho . In brackets is represented the total of cases that were analyzed for each gene. Ten of the 50 (20%) MSI and 21 of the 53 (39.6%) MSS colorectal carcinomas exhibited KRAS mutations. The frequency of KRAS mutations found in the MSI and MSS CRC was not statistical different from the frequency found in colorectal polyps (P = 0.2014 and P = 0.7497, respectively). The same was observed for PIK3CA mutations. MSI and MSS colorectal carcinomas harbour PIK3CA in 8 of the 50 (16%) and in 6 of the 53 (11.3%) cases, respectively. The frequency of mutations found in polyps, although lower in comparison to colorectal carcinomas, is not statistically different from MSI (P = 0.4296 - Fisher's Exact P-Value) and MSS (P > 0.9999 - Fisher's Exact P-Value) colorectal carcinomas. Concerning the frequency of BRAF alterations in colorectal carcinomas, 14 of the 50 (28%) MSI and 4 of the 53 (7.5%) in MSS colorectal tumours show BRAF mutations. We found that MSI CRC and colorectal serrated polyps show a similar frequency of BRAF mutations (P = 0.9112). In contrast, the frequency of BRAF mutations in MSS carcinomas and colorectal polyps is significantly different (P = 0.0191). Distinct types of colorectal polyps represent pre-malignant lesions of the intestinal tract. In our series of colorectal polyps we found the majority (71%) harbour mutations in KRAS (35.3%), PIK3CA (5.9%) or BRAF (29.4%) genes. Regarding KRAS mutations we show that these mutations occur in cases of hyperplasic polyps and in hyperplastic polyps with some areas of dysplasia in accordance to the recent reports of Wynter  and O'Brien  showing that KRAS mutations occur in pre-malignant lesions of the colorectum other than pure adenomas. When comparing the frequency of KRAS mutations found in our series of colorectal polyps with those observed within the MSS and MSI subsets of CRC, the frequency of KRAS mutations found in polyps is not statistically different from the frequency observed in MSI and MSS colorectal tumours (Figure 1). Both observations highlight the role of KRAS activation in the initiation of the different types of sporadic CRC [12–14] besides its role in the adenoma-carcinoma multistep pathway of colorectal carcinogenesis . PIK3CA mutations were found in only one of the polyps (6%) but this frequency is not significantly different from what is observed in CRC independently of MSI status. The mutation found in our series of colorectal polyps was previously described in a colorectal tumour  suggesting that it harbours a pathogenic effect. Further, it is interesting to note that the PIK3CA alteration found in the single affected polyp is wild-type KRAS and BRAF case. This result suggests that mutant PIK3CA is likely to be an alternative rare genetic event to KRAS and BRAF in pre-malignant lesions of the colon. The frequency of BRAF mutations in polyps (30%) is higher than the frequency observed in overall CRC (17%). This observation lead us to speculate that a fraction of BRAF mutant polyps do not progress to carcinoma and remain as non-malignant colorectal lesions as an endpoint stage. In accordance with this, it was demonstrated in mice that expression of active BRAF in the lungs lead to an initial burst of cell proliferation followed by growth arrest rarely inducing spontaneous progression to adenocarcinoma unless mice were deliberately engineered to lack the TP53 or Ink4a/Arf tumour suppressor genes . This study and our data suggest that BRAF may need to cooperate with other factors (genetic or epigenetic) to progress to colorectal carcinoma, as it was previously proposed for human naevi [17, 18]. Noteworthy, the frequency of BRAF mutations in colorectal polyps is similar to the frequency observed in MSI CRC (28%) (P = 0.9112). These data raises the hypothesis that mutant BRAF triggers a distinct pathway of colorectal carcinogenesis leading to the formation of MSI colorectal tumours different from the adenoma-carcinoma sequence. Interestingly BRAF mutations occurred only in polyps with the serrated architecture supporting that BRAF activation is pivotal in the serrated pathway of CRC as advanced previously by Jass [19, 20] and other authors [13, 14, 21, 22]. Analyzing the frequency of CIMP in colorectal polyps we have demonstrated that the results obtained are similar to what was described in CRC [13, 14, 20, 22] showing that BRAF mutations are associated with CIMP phenotype in the initial steps of carcinogenesis before malignant transformation. In contrast, KRAS mutations were only associated to with low levels of methylation as it was previously observed in primary colorectal tumours [19, 23], demonstrating that KRAS mutations are associated to mild effects in the methylation profile during colorectal carcinogenesis. These results support that BRAF mutations harbour a mild oncogenic effect in comparison to KRAS and suggest BRAF mutant colorectal cells need to accumulate extra epigenetic alterations in order to acquire full transformation. MSI and loss of expression of MLH1 due to promoter hypermethylation are frequently associated with BRAF mutation and CIMP in MSI sporadic colorectal tumours [2–4]. In our series of colorectal polyps we did not detected MLH1 promoter hypermethylation which is in agreement with the fact that none of the analyzed polyps harboured MSI. Our data is in agreement with the results previously described in serrated adenomas described by Sawyer  demonstrating that BRAF and CIMP precedes MSI as proposed by the model advanced by O'Brien . The late acquisition of MLH1 methylation leading to the accumulation of mutations throughout the genome targeting important genes (tumour suppressor genes or proto-oncogenes) involved in the control of cellular homeostasis may bridge the transition from a pre-malignant to a malignant lesion. In conclusion, our results show that mutations of KRAS and PIK3CA occur in non-malignant lesions of colorectum and the frequency of these mutations is not distinct in polyps and MSS and MSI CRC demonstrating that these oncogenic alterations are primary genetic events in the two subsets of colorectal carcinogenesis. Further, we show that BRAF mutations occur in association with CIMP phenotype in colorectal serrated polyps while KRAS mutations are found alone. Further we show that only MSI CRC and colorectal serrated polyps harbour similar frequency of BRAF mutations. These results support that BRAF mutations harbour a mild oncogenic effect in comparison to KRAS and suggest that BRAF mutant colorectal cells need to accumulate extra epigenetic alterations in order to acquire full transformation and evolve to MSI CRC. SV did BRAF and PIK3CA mutation screening, performed methylation studies (CIMP and MLH1 methylation) and drafted the manuscript. CM did KRAS mutation screening. LC performed MSI analyses. CA collected patient material with distinct subtypes of colorectal polyps. RH analyzed the MSI status of CRC. FS and FC were responsible for the histological classification of CRC. CO did BRAF and KRAS screening in CRC and helped to draft the manuscript. RS conceived and designed the study, analyzed the results and helped to draft the manuscript. All authors read and approved the final manuscript.